Pharmaniaga Bhd is looking to build Malaysia’s first halal vaccine plant in the northern region of Peninsular Malaysia. The pharmaceutical company is now conducting a feasibility study to build the facility in partnership with Technology Depository Agency Bhd (TDA) and New Delhi- based Hilleman Laboratories (Hilleman Labs). The site is expected to be located in either Bandar Seri Iskandar, Perak, or Sungai Petani in Kedah. MD Datuk Farshila Emran said the new plant is expected to be completed between 2020 and 2022, with the first commercial batches set to be introduced two years later. “We are still in the feasibility stage, but we expect to produce the first batch in 2024,” she told reporters after the company’s AGM in Damansara yesterday. The group currently has a total landbank size of 70ha across the country. Its land areas are situated in the Klang Valley, Perak, Penang, Kedah, Sabah and Sarawak. Farshila said a sizeable portion in the northern region of Peninsular Malaysia has not been utilised, and will be designated for the plant. Farshila had also dismissed earlier reports that Pharmaniaga would set up a halal vaccine facility at its existing plant site in Puchong, stating that the idea was still being discussed at the time. It was previously reported that Pharmaniaga would invest RM100 million on a halal vaccine manufacturing facility in Malaysia for the production of halal and cost-effective vaccines. Funds for the project is said to be internally generated, with TDA expected to source for further investments from the Middle East, Europe and China for the vaccine development programme. The group is moving away from its traditional concession business by expanding its breadth in the private segment and exports in the region. The company is looking to bring in a range of new products to meet demands in the local private sector and widen its international reach through its Indonesian operations. The latter contributed 32% to the group’s revenue last year. “We plan to increase our market share in the private sector by introducing more over-the-counter and consumer healthcare products. We are doing it aggressively this year to further reduce our dependency on the concession business,” Farshila said. Last year, its non-concession business contributed 51% to the company’s overall turnover, up from 49% in the previous year. The company has allocated RM75 million in capital expenditure this year to be used for machinery upgrades, new warehouse facilities and the development of new products. Pharmaniaga currently has a portfolio of over 200 products with more are being developed under its research and development unit. The group is targeting an excess of 250 products by 2024, with new therapeutic categories to be included. 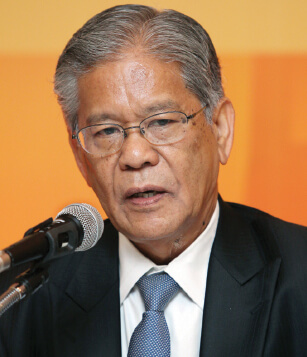 Chairman Tan Sri Lodin Wok Kamaruddin, however, said the group’s renewed focus on its non-concession business is not an indication of a reduction in supplies under its con- cession agreement with the government. Pharmaniaga currently has a 10-year concession agreement with the Ministry of Health, which began on Dec 1, 2009. The contract involves the purchasing, storage, supply, as well as distribution of approved drugs and medical products to government hospitals and clinics. Lodin said he is confident the concession will be renewed. This article first appeared in The Edge Financial Daily, on April 12, 2018. PETALING JAYA: Pharmaniaga Bhd said its Indonesian business is “doing very well” with its halal products gaining more traction amid the population growth and increasing affluence in the country. Its chairman Tan Sri Lodin Wok Kamaruddin said the group is forecasting a revenue growth of up to 18% this year from the Indonesian operations. “Both of our operations there, namely PT Errita Pharma and PT Millennium Pharmacon International Tbk, were profitable last year,” Lodin told reporters after the group’s annual general meeting yesterday. For the financial year ended Dec 31, 2017 (FY17), Pharmaniaga’s revenue grew 6% year-on-year to RM2.3 billion, of which about 32% or RM734 million came from the Indonesian operations. “We are confident that Indonesia will continue to do well and contribute profits to the group in the future,” said Lodin. For FY18, Pharmaniaga is putting aside RM75 million for capital expenditure which will be used to upgrade its machinery in Indonesia and warehousing facilities in Malaysia. Managing director Datuk Farshila Emran said the group’s planned halal vaccine plant is on track. She added that the site could be in Seri Iskandar, Perak, or Sungai Petani, Kedah, and not in Puchong, Selangor, as earlier announced. In December 2017, Pharmaniaga said it would be investing RM100 million over three years to establish a plant to manufacture halal vaccines. It signed a collaboration agreement with the Technology Depository Agency (TDA) and India-based Hilleman Laboratories. Under the collaboration, Pharmaniaga and TDA will work hand in hand to coordinate the efforts in developing and manufacturing vaccines that can be incorporated into Malaysia’s National Immunisation Programmes while Hilleman Labs will provide vaccine know-how and technologies. Farshila added that the group will also step up its marketing of products to the European Union (EU). Pharmaniaga currently has more than 200 products, with more than 60 of them halal-certified. According to its annual report, the group expects to receive halal certification for more than 150 pharmaceutical products by the end of 2019. While the group is focused on growing its non-concession business, Lodin said the concession segment will remain, and is confident it will be renewed. Pharmaniaga’s share price rose two sen or 0.48% to RM4.20 yesterday, with a market value of RM1.09 billion.